Knitprovisation: 70 Imaginative Projects Mixing Old with New I love this book, because it shows me ways to think that I couldn’t even imagine before seeing them. But I agree with the reviews written before mine, this is not a book for the average person. If you like cute or stylish or if you are the kind of person that likes to “blend in” this is not the book for you. 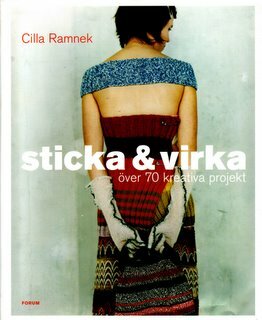 Cilla Ramnek takes second hand knit wear and makes them into funky clothes art! I’m not even saying I would wear anything from this book, but I feel the inspiration flowing from the pages. This book is a book to look through over and over again, before going to flea market or sitting down to design something new at the sewing machine. I want to use crocheted pot-holders on a bag, make a sweater out of not-at-all matching materials and experiment with my own knitting and sewing more. It’s just fun, smart and experimental! Get it if you are curious! Other cool internet news: I’ve did my first buy at etsy, and I can’t wait to get my goodies. From where, you might ask. Why Theresa of course! Next thing might be this magnet!? Have you seen this youtube movie where a guy draws for days at the white board? I’ve seen it a couple of times now – amazing stuff! Check it out, but sit down or you’ll be dizzy! You can now file your sets of photos into different folders; “collections”, at flickr.com. I’ve been wanting this tool since I signed up over there, and now it’s here. Thank you flickr team! Free stuff! Sign up for all the arty give-away-stuff over here! Knitted Graffiti Art – what a hooligan I am! This entry was posted in Inspiration, Thoughts on Creativity and tagged oddball craft, swedish book. Bookmark the permalink. Jeg har lige k?bt en anden bog p? Amazone som jeg vil anbefale: “Childhood Treassures” – den tog helt vejret fra mig – s? smukke er dens illustrationer… den kom ,med posten forleden. M?ske skulle jeg skrive om den p? min blog??? Jeg vil ogs? straks tjekke din anbefaling. Er den lidt i stil med Doredo? Sp?ndende men ogs? lidt grim? You are right that something doesn’t have to be perfect nor pretty to be inspiring. The book you mention seems to “think outside the box,” that is inspiring! !